It is almost end of January, and like every year we expected to experience beautiful cold withering winds, the dry air, layers of clothes, beautiful scarves and warm hugs from our tea cups and bowl of soups. Surprisingly, in the Bay Area, we have been experiencing a lot of rains, technically so good for NorCal, but so unexpected. I enjoy cooking and munching when it rains. I also love little hugs from my teacups to keep me warm with some crisp and soft munchies. Growing up, my favorite munching snacks were mathiya and chakri. We always used to have these in the kitchen, and I absolutely loved them every single day. So today, I felt like enjoying chakris with my tea and so started making them. I made these delicious spiral wheels for the first time today. As a kid, I remember rolling them on the table, playing and eating them. It was quite fantasizing back then. 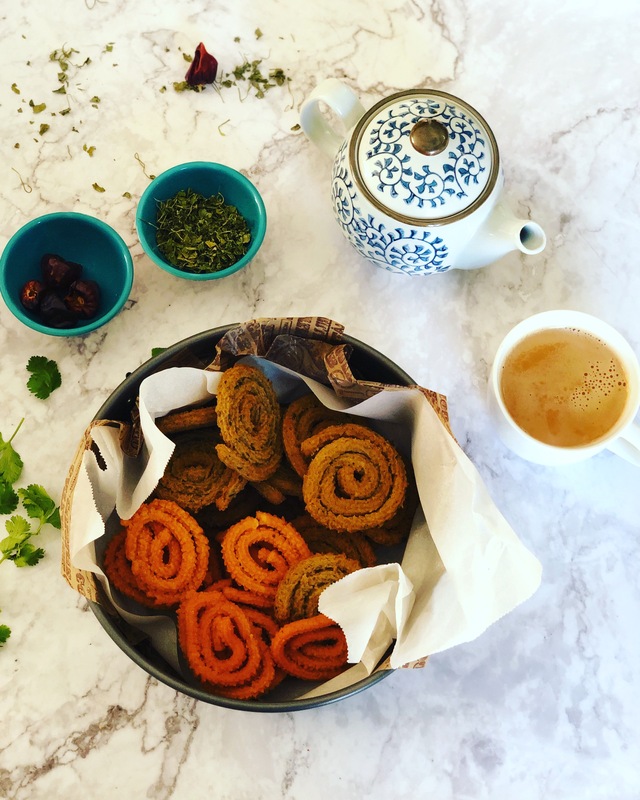 The amazing thing about Chakri’s is that though India being so diverse, this snack might have different names, but we all love it. It is typically made using different types of flours like rice, wheat, chickpea etc. flavored with beautiful spices our country is gifted with. This snack is easy to make and can be made from the ingredients we have in our kitchen each day every day. Today I made the regular chakri and the cilantro-mint-dried fenugreek leaves (kasuri methi) chakri. The delectable chakris are made in the traditional way with using rice flour, butter, yogurt and spices like red paprika, turmeric powder, cumin powder, coriander powder, and salt. The other one is prepared using wheat flour, butter, yogurt and beautifully spiced with cilantro, green chilies, ginger, mint, kasuri methi (dry fenugreek leaves), red paprika powder, coriander and cumin powder, a pinch of garam masala and salt to taste. I used butter to keep the chakris soft from inside but yet crisp on the outside. Let us dig in to prepare the beauties. Sieve 2 Cups of Rice Flour in a big bowl. Now add butter, yogurt, red paprika, coriander powder, cumin powder, and salt. Now add water little by little to knead a soft dough. Divide the dough into four equal parts. Grease the Kitchen Press with butter or oil. Once you are done pressing the chakris, you will be ready to fry them. Fry them until golden. Let them cool and transfer them to a storage container. Sieve 2 Cups of Wheat Flour in a big bowl. Now add butter, yogurt, Green Paste, red paprika, turmeric powder, coriander powder, cumin powder, garam masala, and salt. Be careful while adding water. Add water as required. Knead the dough soft. This will help you to form the spirals easily. I am using butter to keep them soft from inside while they are deliciously crisp from the outside. While using the kitchen press, place it a little higher to see if you are rolling your spirals the right way. I was born and brought up in Gujarat. Growing up eating Gujarati homemade delicacies, my family was also a big fan of restaurants. We used to visit many vegetarian restaurants and our family favourite was always a South-Indian restaurant. We all will go gaga and drool over those Mysore masala dosas, idlis and vadas. After drooling over this yumminess, after 21 years I met Ajay (the husband). Before I met him south Indian food for me meant idli, dosa, sambhar and coconut chutney. Nothing above or beyond it. The fun fact of my life is I learnt all the Tamilian cooking just for the husband. I was a disaster to make dosas at first, but still, my husband will happily support me and eat those unshaped dosas. Fast forward a little and I start working in Chicago after I finished my Master’s. I started living in a single-family home each floor shared by a Tamilian family. I was on the 2nd floor. Living alone, I didn’t cook much, just some things that I like mostly because I used to keep myself busy with my new job. On one fine Saturday evening, a lady drops by and introduces herself. She says “my name is Janani, I live downstairs”, tells my friend. I was not at home I guess when she came. After some time, when I come back, my friend informs me that my neighbour came to see me. So, I decided to go and say hi to her. And I ended up spending an hour at her place, isn’t that amazing?? I got connected with her right away. Day after day we started meeting and we became best friends. I used to tell her, how I want to learn south Indian food and she tells me that is simple. She very simply taught me all the basic things about running south Indian kitchen and I kept exploring and here I am. I wanted best for my husband. And I thank Janani for teaching me everything. Chutney podi is one of the things that surprised my husband that I made it at home. He was so happy. I felt the happiest to see him so happy and proud of me. And this is how I ended up introducing myself to the Tamil kitchen. And it is awesome. The spiced lentil powder or the chutney podi as we call it is a simple spiced powder that enlightens the idlis and dosas. Don’t have time to make chutney or sambhar, just keep this spiced lentil powder at your home and you will be ready to indulge in idli’s and dosa’s anytime you want. Let’s learn how to make this simple spice that will add life to your plate. 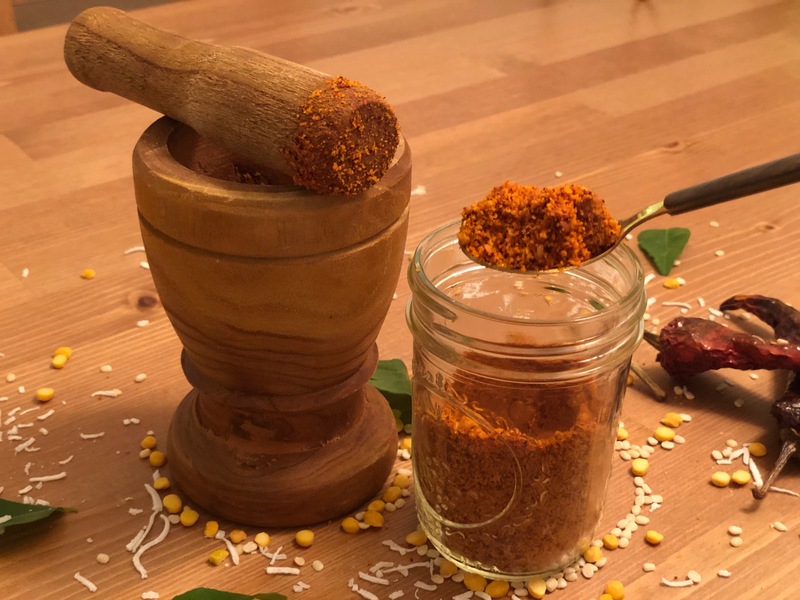 The recipe for this beautiful spiced lentil powder or chutney podi is very simple, easy and very quick to make. Let’s start preparing this crumbling scrumptious chutney powder. Heat a pan on medium low flame with a thick bottom. Add oil. Now add Chana dal, Urad Dal and Coconut. Fry them until you smell that soft aroma of the dry roast. Once roasted, keep the roasted dals and coconut in a plate on the side. In the same pan, add oil again to the pan. Add asafoetida. Now add the 6 dry red chillies. I added 6 but you can adjust the spice level as per your taste. Keep the chillies aside too. In a grinder grind all of it into a fine powder. And your spiced lentil powder aka chutney podi is ready. The other day I fried leftover idlis in this chutney podi and it tasted absolutely scrumptious and so amazing. Serve hot with some peanut chutney or tomato onion chutney. October has started and the blogs are flooded with all the possible pumpkin recipes. Pumpkin curry, Pumpkin tart, Bundt Pumpkin Cake, and the list goes on and on. But, I had berries in my refrigerator and no pumpkin puree or a pumpkin altogether. Sunk in the thoughts of making a tart, and no pumpkin in October, I ask the husband if it is okay to keep the all-around season of berries alive and not the season favourite pumpkin? I cry to myself that I want to make a chocolate pumpkin tart, but I have no time to run to the grocery store. The guests are coming. The Red Berries Custard Tart it is, I decide. I tell myself I can bring the pumpkin season on my blog in the coming weeks. Tarts in our family were quite like a tradition growing up. Rewinding back to being a kid, strolling around with a book and scratching something no one understands, I was well fed with different bakes. I am sure nobody remembers that phase of life… even I didn’t. My mom told me what I used to be/do as a kid. But, there is a thing I do remember, they are my Baa’s (Granny) Bakes. She used to make us her mini beautiful jam tarts all the time. Over the time, she has baked a lot of things for us but the mini tarts were my favourite. She used to make a shortbread pastry crust and fill them with homemade mixed fruit jams. I remember her telling me that I can fill these up with any filling I would like spicy or sweet anything and that will make me go gaga about the tarts. Probably that’s why my eyes still twinkle when I hear TARTS. Back to my tart, I have had many different varieties of tarts but never baked one. This makes me super nervous. My skin feels the shiver of nervousness. I just want to get the tart right, because I want my granny to be proud of me. She is an exemplary cook and a baker. And I start my prep for the tarts, and as time goes I kept rolling with the art of making tarts engrossed checking one box after the other. Baking works like a therapy for me. It illuminates me with positivity, it fills me up with excitement and sheer joy. For me rolling the tart, folding it and placing it in the tart mould was the most difficult part. But, the most beautiful part of the story is when you place your part to bake. In a separate mixing bowl, add the flour, almond flour and salt. Mix well. Take a clingfilm (plastic wrap) and put the dough in it and wrap it. Chill the pastry dough for one hour. After an hour lay a baking paper on the kitchen counter. Remove the plastic wrap and place the dough on the baking paper. Once done put the mould on top of the pastry to get an estimate if the rolled dough will be sufficient to fit the mould. The pastry before the bake should look like this. Now place the mould to chill for half an hour. In a food processor, (you can also use your hand mixer or beater) add the cream cheese. I have used 8 oz cream cheese because I wanted to make fruit custard bowls too. Start mixing it until the cream cheese is fluffy. Now add the eggs one by one and mix them. In goes the sugar and mix. Once this is nice and fluffy add the cream. Now my fruits and custard are ready. The oven is preheated at 400 F. And the pastry is chilled for half an hour. It’s time to put the pastry in for the bake. Bake the Pastry at 400 F for 10 to 15 mins until golden brown. The pastry should look like this. Let the tart cool down. Once it reaches room temperature, add the custard in the tart. 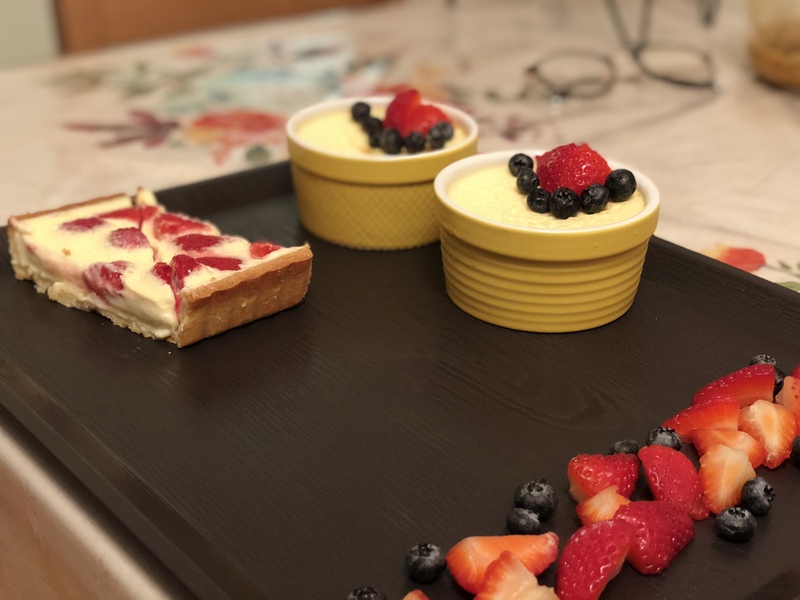 I like to put my tart mould in a baking tray so it is easy to take the tart and place it in the oven without making a mess. Now top the tart with the berries. In goes the Red Berries Custard Tart on 400 F for 25 mins. This will bake the pastry and set the custard. After 25 mins lightly shake the tray to see if the custard shakes. If the custard doesn’t shake that means it is set and done right. Let the tart cool down, serve as you prefer, warm, cool or chilled. All of them taste delicious. Quickly, if you have more custard take the ramekins. and pour the custard in it. Let it set for 425 F for 25 mins. The custard will set and top them with fruits of your choice and eat it as a custard bowl. or invert the ramekins and take the custard out. Top it with caramel and there you go… you can treat yourself with a beautiful custard flan. I was at the grocery store last weekend, and I start collecting the groceries for the week. Just like any other week, I am looking forward to making the greens and try out some new recipes if I could. The luscious smell of the fresh green herbs, the sweet smell of fruits and flowers… The beautiful berries of all kinds. It is just so amazing. Always happy to be at the grocery store. Anyways, back to picking up groceries for the week, the husband gets paranoid when I start picking up beetroots. He calls out to me and says… “oh … not again Aayushi babes”. I turn and ask what is it? He continues,” I won’t eat beetroots, I don’t like them”. This happens every week. He instead points out to mangoes. Mangoes are everyone’s favourite and so is ours. Like every other week, he wanted a dish full of mango rice with tomato and onion pachdi (raita). Along with the side of the potato, turnip fry or broccoli-peas -tomato fry. Now the husband doesn’t know how I am thinking to take a roll on his taste buds, but that leaves me with a question of how? 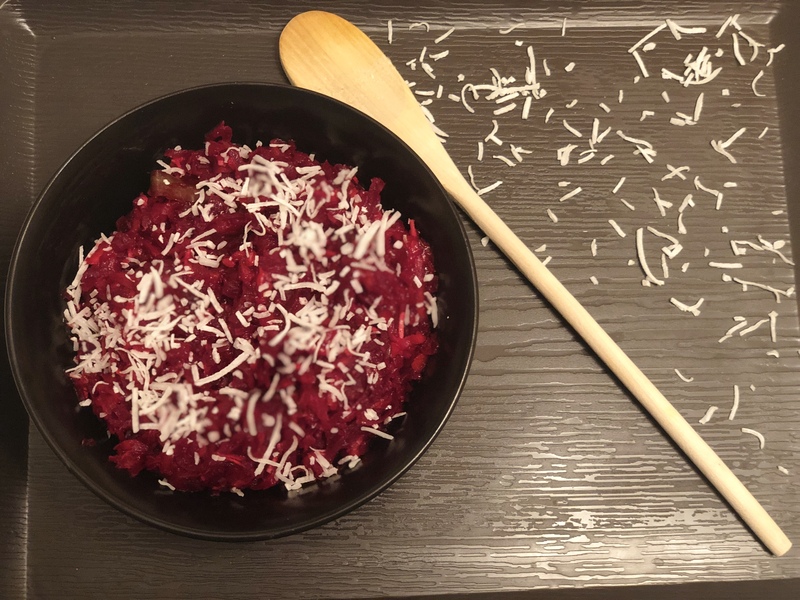 On a Thursday afternoon, I was sitting on my couch watching TV, sunk in the thoughts what can I possibly do to make the beetroots so tasty, that the husband cannot say no to beetroots ever. A salad is definitely not going to be an option for making the husband like beetroots. I know what’s going to happen if I make a salad! The husband is going to savour on all the mangoes and leave me with a bowl full of beetroots, kale and lettuce. I imagined so and laughed to myself. I make beetroot poriyal quite often. So I use the same recipe, and I add the king of fruits mangoes along with coconut. The recipe speaks for itself to be a surprise, so let us see how. The beetroots and mangoes are going to take you to sweet and savoury side. The flavours of mangoes, beetroots and fresh shredded coconut took me to a private island hanging out with the husband enjoying virgin margaritas, a plate of freshly cut tropical fruits and some pina coladas. As always amazed by the beauty of nature, at my dinner I enjoyed how nature created such great flavours. Trust me, I didn’t put any spices to flavour this wonderful treat. Let’s start cooking this tropical deliciousness!!! Now is the time to put the ingredients on flame!!! Place a pan on a medium flame. Add a Tbsp of oil, I used coconut oil, but you can use any oil of your choice. Add the cumin seeds and let them splutter. Add the two slit green chillies now and saute. It’s time to throw in the finely chopped or julienned onions, in any way you like them. Once the onions turn translucent, add the beetroots, salt to taste and cover the pan. The beetroots will take maybe 5-7 mins to cook. Keep stirring them every 2 mins, to avoid the beetroots sticking to the pan. Once the beetroots are soft… add the shredded mangoes. The mangoes cook in no time. and they get to take the colour of the beetroots and start turning to be a savoury surprise for our tropical fry. Add the coconut and close the pan for a minute. The Suprise Tropical Fry is ready. Take it out in a serving bowl and add some dry shredded coconut for the topping and serve. Give this recipe a star, if you like it and give it a try… it is awesome!!! It was a definite hit for us!! Whenever I start preparing the raw materials for the daily meals, there is always one thing that makes me walk down a memory trail. My mom in the kitchen preparing us her beautiful home cooking recipes. She makes utmost tasty, scrumptious, simple and beautiful food for us. Her recipes are so easy to follow. When I moved to the United States, she used to guide me to prepare food on facetime. I would just follow what she says and then there it goes …just perfect and easy. I attempt to make just like hers, but there will always be an element missing. The element is missing the food my mom used to cook. I used to talk to my mom in the kitchen while she prepared food for dinner. At the time, I thought that I am just in the kitchen because my mom is preparing the dinner and that’s the time of the day I can talk to her after finishing up with my daily chores. She used to tell me she was always in the kitchen as I was a hungry baby of all times and if she is around me I still am. But, know when I think about it, as I stood there in the kitchen with her, I used to observe her, while preparing the raw material, cooking like 4-5 different dishes at the same time, the spices she will use, and of course the lessons she will give about cooking while she is cooking. As my mother quotes “I don’t like cooking” she says and I go back to her and ask her, then how do you cook everything so delicious. She would just smile back. She didn’t like cooking, but she would still attend cooking classes so she can make us all the food we like at home… in all her glory of healthy and fresh cooking. My mom nurtured me and my sister for what we are today. Two days back I was talking to my dad about what he had for dinner. My mom that day, prepared sev tameta nu shaak and bhakri. It’s a kathiyawadi delicacy, which is prepared at least once a week at our home. My dad says, my sister and I are good cooks, just because of our mom. She has passed her cooking legacy to us, and I totally agree with him on this. My mom was sitting next to him, blushes a little and goes back to catching up with her Instagram. I know you are going to read this, my dear mother … just to let you know, you will always be an idol to me in every way, and I hope I will be able to nurture my family the way you did. This one is for you mumma. Cluster beans are low carb veggies, which is an excellent source of nutritional value added to our plate. They are rich in Vitamin K, Vitamin C, Iron and Calcium. These also have foliates which help with maintaining reproductive health. These veggies help in resolving anaemia, control diabetes, and stronger bone health. And these are a very good source of plant-based protein too. On a medium-high flame, place a pan and add I tbsp oil. Once the pan is heated, add cumin seeds. Let the cumin seeds splutter and add a pinch of asafoetida. Turn the flame to medium-low. Add the ginger garlic paste and saute it until it is cooked. Now it is time to add the spices. Start with adding turmeric, red chilli powder and coriander-cumin powder. You can also add little garam masala at this time. Saute them well. Now add the beaten yoghurt. Keep stirring so the yoghurt cooks well and doesn’t get separated with water. Once cooked, add half cup water (I used the same water used for boiling the cluster beans- this will help the curry with maintaining the nutrition and taste) and keep stirring. Now add the boiled cluster beans to the curry. Let it boil for a minute. And top the curry with some Kasuri methi ( dried fenugreek leaves). Let’s dig in…I served this curry with Split Back Urad Dal and Phulka’s (Chapatis). A perfect healthy meal to balance the daily intake of carbs, protein and healthy fat and fibre. It’s amazing how the weekend brings a big glittery smile on everyone’s face, and when the weekend comes to an end it brings with it a big drop of that glittery smile. I believe in ending the weekends well. That’s why it calls for CAKE….. This weekend it calls for my favourite lemon cake. I usually used to bake my cakes in the traditional way. But then, I was diagnosed with insulin resistance and hormonal imbalance, aka polycystic ovary syndrome. It was my nightmare which came true and I asked myself “why me?”. There was no reason to sit and cry. Instead, I decided to fight it. I know it’s going to be there with me for the lifetime, there is no way it’s going away. I also knew I can’t stop eating cakes. I have made this lemon cake using almond flour and I replaced the sweetener (white sugar) with honey and coconut palm sugar. I know I know, by using honey and coconut palm sugar I am not totally avoiding the sugar. But these have those tiny nutrients like magnesium, zinc and antioxidants. Don’t worry, I have just used a little bit of it. I just to add stevia if your case is very severe, or if you have Type 1 or Type 2 Diabetes. Lets Bake…The beautiful and moist lemon cake. Take two bowls. Add the dry ingredients in a bowl- almond flour, sweetener of your choice(here I have used coconut palm sugar, I have added just a little because my main sweetener is organic, natural honey which I will be adding with wet ingredients), lemon zest, baking soda and a pinch of salt. Mix all the dry ingredients well. In another bowl, add lemon juice and egg whites. Whisk it till fluffy. Add honey, olive oil and vanilla essence. Whisk all the wet ingredients very well. Let the honey mix well. Add the wet ingredients with the dry ingredients and fold the mixture well. But don’t fold it a lot of times, the cake might lose its moisture. Ohh, you can also add blueberries and fold them in the mixture at this point. They bring out a lovely flavour in the cake. Quick tip, rinse the blueberries well and marinate them with some flour. This will help your blueberries not sink in the bottom of the cake. Preheat your oven at 350F for 10 minutes. In a cake mould of your choice, place the baking paper and add the cake batter in it. Set it equally by tapping the sides. Once, the oven is pre-heated and ready, get your cake in to bake at 350F for 30 mins. Let’s prepare the frosting in the meantime. In a bowl, take 8oz of creme cheese. Mash the cream cheese bar using a spoon or a fork. Start adding the butter cubes one by one and mixing them with a hand mixer. mix it until nice a fluffy. Add the frosting in the piping bag and chill for some time. Our lemon cake is out of the oven now, and its time for it to cool down. Once the cake is cool, you can start icing the cake. Soft winds, light drizzle, birds chirping and beautiful tender sunshine in my patio. It glazed my home garden with a beautiful view. While admiring the beauty, my tummy grunts and says I am hungry!!! After a while, I open my refrigerator glance through and think about eating something yummy but quick to make. Something quick and yummy I say to myself, umm.. ooh yes.. I see leftover dosa batter!! Yaaayyyy!!! I finally decide to make our family favourite kuzhi paniyarams (I call them little tots of goodness). I decide to make the spicy paniyarams. While I am at it, paniyarams are made from rice and black lentil batter. I used the left over dosa batter, next I want to try ragi dosa batter to make a healthier version of these little tots. 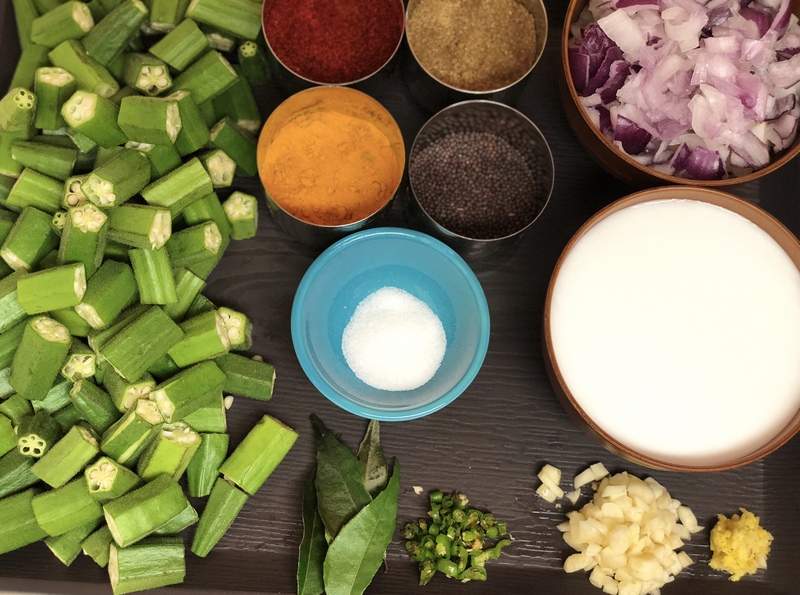 I choose to flavour my paniyarams with lots of green chillies, ginger, shallots, curry leaves, carrots and green peppers. I chop all my veggies finely making sure that my shallots, carrots and green peppers are of the same size and shape. I saute everything in coconut oil and add my fillings to the dosa batter. Now this yumminess is ready to be steamed. I love to serve these tiny tots with onion tomato chutney and ellu podi. For the recipe keep scrolling.. Transfer the batter in a bowl. Let it set to room temperature. In the meantime, take a pan, on a medium flame, heat some coconut oil. Once the coconut oil heats up, add ginger, curry leaves, green chillies and sauté them for a half-minute. Add shallots, carrots and green peppers to the pan. Sauté them for a minute. Turn off the flames (this step is the most important one) Let the filling cool down a little and add it to the dosa batter. Add salt to taste and mix the batter well. Preheat the paniyaram pan on medium heat. Pour little coconut oil in each mold (nonstick pans will need less oil than the iron cast pans) and let it heat. Once ready, pour a spoonful batter in each mold and close it with a lid. Give it a minute to a minute and half.. and flip them to the other side. After flipping again give it a minute. And they are ready !!!!!! Little tots of goodness are all ready to be served!!!! Umm wait…. Tomato Onion Chutney… Lets make it quickly – Dice one onion and one tomato. You will need two dry red chillies too. Take a pan, heat up the coconut oil and add dry red chillies and Onions. Let onions caramelise.. my friend Dharini says that’s the secret to this amazing tasting chutney(Thanks Dharini for giving me the recipe for this chutney). Once the onions are caramelised add the tomatoes. Add salt to taste. It will help the tomatoes cook faster. Once they cool down, make a soft puree of this mixture. Add the tadka with some mustard seeds and the chutney is ready! !